The fields of the Meadows provided an ideal venue for the rough, violent, traditional game of football. Records and memories of these matches are largely lost in the mists of time, but as late as 1832 the local press reported a revival of the Shrove Tuesday football match in the Meadows, the participants having been fortified by a pre-match visit to the Royal Children Inn! By the 1860s housing had begun to spread across the green fields and the newly formalised and organised football was then played on specially designated grounds. Notts County (founded in 1862) played their very first home match against Trent Valley at the Meadows Cricket Ground on Queens Walk; this pitch was to remain County’s home ground for the next fifteen years. In April 1866 County entertained Nottingham Forest (founded 1865) on the Meadows. At the end of a “pleasant and well-contested game” the score remained nil-nil. Forest too made their home on the Meadows in the 1870’s, returning in the 1890’s to play at the Town Ground on Bathley Street – the site is now occupied by the Corporation Bus Depot. In 1901 the Victoria Embankment playing fields were opened. By 1908, at least eleven clubs played their home games there. These included Notts County’s reserve team, St. Saviours, Nottingham St. Peters and Notts Corinthians. Several clubs were set up by workers who enjoyed the pleasure of the Thursday half-holiday, or “Half Day Closing”: Bridgford Thursday, Post Office and Tramway Institute were all members of the Notts Thursday League which, by the 1950s included teams from the City and County Police and Fire Brigades. In the post war years the “Bank” hosted several notable teams – Grove Celtic for example produced several players who were snapped up by professional clubs and the Meadows Boys Club was a nursery for talented young players. Football is still played on the Victoria Embankment, though usage has declined. Sadly the smaller football venues in the Meadows have gone – Notts Olympic Reserves no longer utilise the Clifton Colliery Ground as they did in 1908, Meadows Albion’s use of the ground in the 1970s has passed into history, although the club lives on as Greenwood Meadows FC. 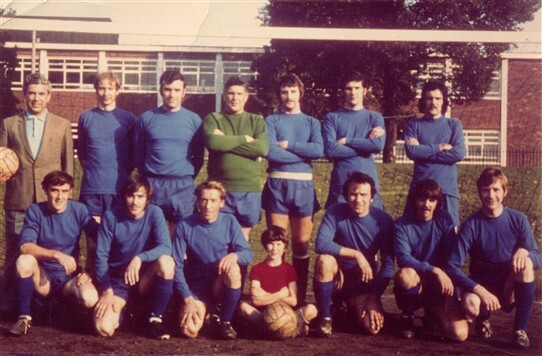 Have you memories or photos of football on the Vicky Embankment or the Clifton Colliery Ground? Why not post them on the site. This page was added by Sarah Malina on 24/03/2011.